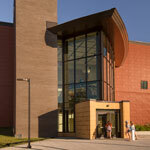 This project involved re-purposing an underutilized historic gymnasium into a twenty-first century learning community for the University’s Business College. The seven smart classrooms and learning laboratories were designed to encourage active and collaborative learning, and are supported by informal study spaces that can be used for individual or collaborative work. A 1,200 square foot addition of a contemporary, light-filled atrium projects from the building’s revamped east façade, securing the building at the heart of campus. With sustainability as one of the University’s core values, this project’s sustainability goals focused on asset preservation and energy efficiency. Re-purposing the existing building enabled 90% of the final materials to be salvaged or reused, including the wood gymnasium floor and the wood bleachers, which were reused as wall paneling. Energy-efficiency strategies included high-efficiency light fixtures and lighting controls, as well as new HVAC systems and controls. Suspended displacement ventilation, total energy plate exchangers, variable frequency drives, and airflow measurement devices were incorporated into the HVAC design. Using the B3 Guidelines helped the project team set sustainability goals early in the design and prioritize these goals throughout the process. This project was a finalist for the 2016 Best of B3 Design Award.